Neither Michael Laudrup or Tim Sherwood would appear to be QPR chairman Tony Fernandes's "dream manager"
Michael Laudrup has ruled himself out of becoming the next manager of QPR. Laudrup, currently in charge of Qatari side Lekhwiya, had been the bookmakers' favourite but clarified his position in an interview with Danish newspaper Ekstra Bladet. "I have no intention to leave Lekhwiya at this time," said the former Swansea City boss. Talks between Tim Sherwood and QPR about becoming manager at Loftus Road ended this week. Sherwood was the clear frontrunner after being contacted by the club following the resignation of Harry Redknapp, but negotiations with the ex-Tottenham boss came to a halt. 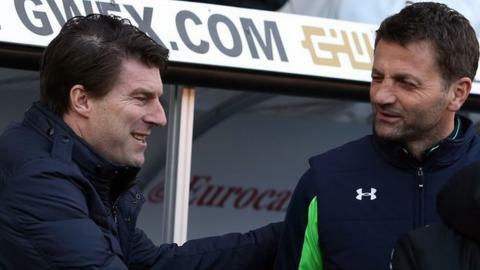 Bookmakers turned their attentions to Laudrup, but he has insisted his short-term ambitions lie with the Qatari club. "We are number one in the league, starting group stage of the [Asian] Champions League in two weeks and also have a cup waiting," he said. "So the next three-and-a-half months will be exciting and intense." Real Madrid assistant manager Paul Clement and Brentford's Mark Warburton have been linked with the position. QPR chairman Tony Fernandes believes he has identified the "dream manager" - but has not revealed who that is. He said there was "still a bit to go" to complete the deal. Sherwood had sought assurances over the club's future plans and expressed concern about the impact relegation from the Premier League might have, with the club potentially facing a £54m Football League fine or a transfer embargo for breaching financial fair play rules in their promotion season. Academy coach Ramsey and director of football Les Ferdinand took temporary charge after Redknapp, 67, stepped aside on 3 February, saying imminent knee replacement surgery was going to stop him giving 100% to the job. The club now have a 10-day break following their first away victory of the season at Sunderland. When asked to comment about being among the favourites for the QPR manager's job, Brentford boss Warburton - whose own job is in doubt - told BBC Sport: "Bookmakers get many, many things wrong - that's all I can say. "It would be totally disrespectful to this squad of players, to this club and to the fans and disrespectful to QPR as well - and they've got people that I know in situ at the moment, really good people, so that would be totally disrespectful. "My only focus is Brentford Football Club." What does record TV deal mean?